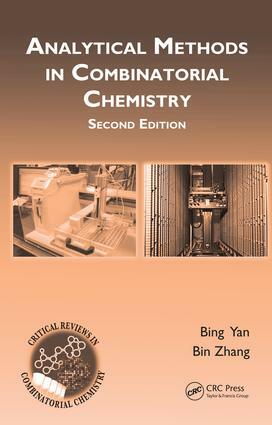 Analytical issues in combinatorial chemistry. An examination of the analytical sample resin support. Solid-phase reaction optimization using FTIR. Reaction optimization using MS and NMR methods. Reaction optimization using spectrophotometric and other methods. Quality control of combinatorial libraries. High-throughput purification. Final Thoughts and Future Perspectives. Bing Yan received his Ph.D. from Columbia University with Koji Nakanishi in 1990. He is a faculty member at the Department of Chemical Biology and Therapeutics at St. Jude Children's Research Hospital in Memphis, Tennessee, and an adjunct professor at Shandong University.